The Birth of German Baroque Music. 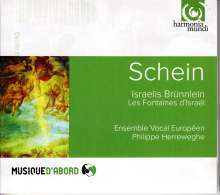 Schein was one of the most illustrious of Bach's predecessors at St. Thomas in Leipzig. His work, eclipsed for a long time by the historic stature of his contemporary Heinrich Schütz, is today acknowledged to be one of the jewels in the Protestant sacred repertory. 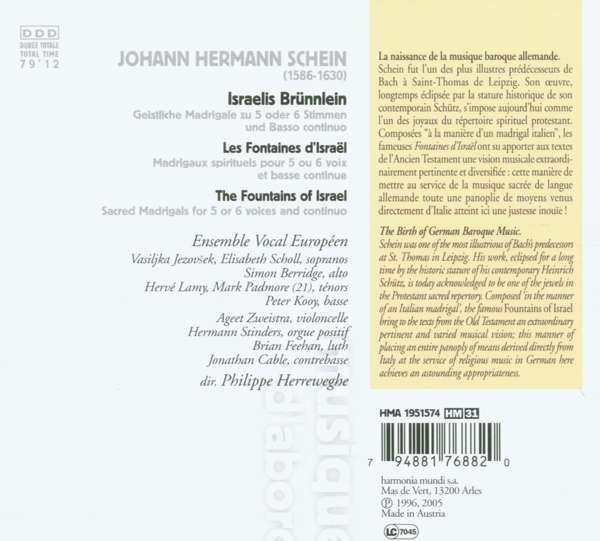 Composed ‘in the manner of an Italian madrigal', the famous Fountains of Israel bring to the texts from the Old Testament an extraordinary pertinent and varied musical vision; this manner of placing an entire panoply of means derived directly from Italy at the service of religious music in German here achieves an astounding appropriateness. F. P. Messmer in FonoForum 5 / 97: "Ein fesselndes Hör- erlebnis! Herreweghe nimmt in Scheins Musik jede Silbe und jeden Ton ernst. 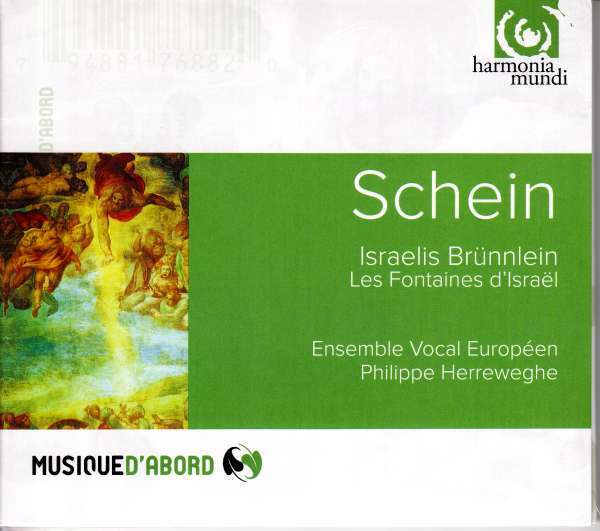 Das Ensemble singt kammermusika- lisch fein, nie manieristisch und höchst lebendig. Die Bedeutung der Worte wird durch die Melodie und vor allem durch den Rhythmus so direkt und eindrucks- voll dargestellt, daß Scheins Musik seltsam modern und gegenwärtig wirkt."